Place the strawberries in a pan, add half of the preserving sugar, bring to the boil then boil fast for approx. 2 mins., stirring constantly. Add the remainder of the preserving sugar while stirring, then boil for a further 2 mins. Skim off any foam. Spoon a small amount of the hot jam onto a plate, leave to cool. If it is no longer runny and forms a thin skin after a short while, it has achieved the right consistency. If not, continue to boil briefly and then test it again. Ladle the jam into the clean, pre-warmed jars while still boiling hot, fill the jars to just below the rim, seal immediately. Briefly upend the screw-top jars, leave to cool on a towel. 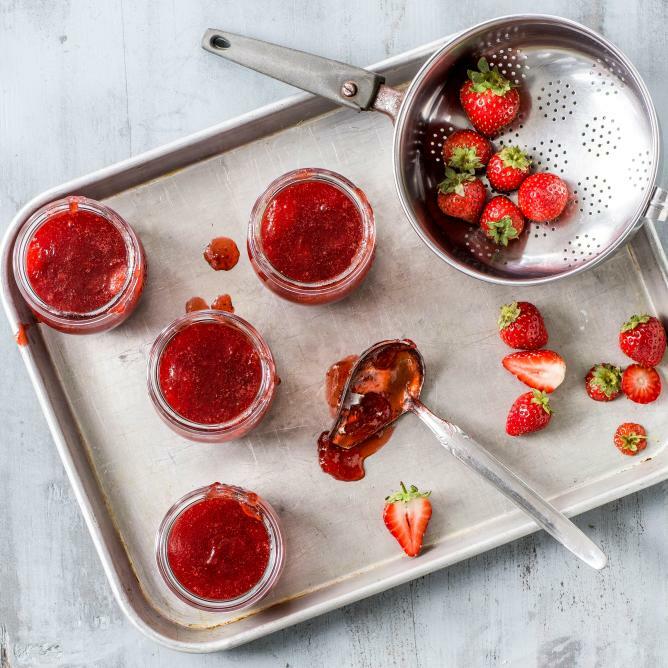 Strawberry jam with black pepper: Add 1 tsp of crushed black peppercorns to the strawberries. Prepare the jam as above.